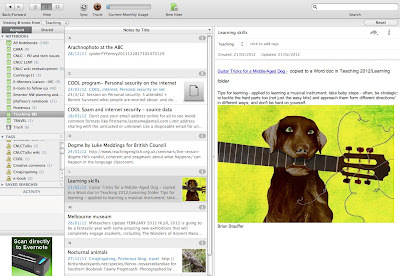 It's awhile since I promoted a web tool in this blog - but I've become a convert to Evernote, not just because the folks at Evernote proudly promote it with a video showing Jack and Jill (Jill's the smart one with Evernote, Jack's got sticky notes all over the place and is totally disorganised!). 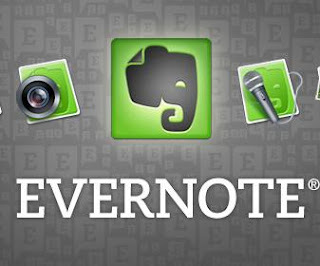 Evernote is widely used for grouping your Notes (free text) in Notebooks (folders of related notes) across platforms on a PC or Mac and synchronised to your Netbook/ laptop, iphone (apparently - I don't have one of those yet) and tablet/ ipad (ditto). It's really useful in the planning stages for a project or learning task because you can collect links and files together with your Note, and tag your notes (to search by subject tag later, when your collection of Notes and Notebooks has grown). You can also record some audio - that's right - just click the little microphone icon to record your thoughts/ comments and the recording is then attached to the Note. So how is Evernote different to Dropbox or Google docs? All are useful in different contexts: I use Dropbox to gain access to work files at home across two machines and at work (I think I've got it on 3 PCs there at last count...). And I use Google to collaborate with others and publish (embed) in the wiki. But Evernote is becoming an indispensable tool in my personal and work organisation, in project planning and in research. You can also listen to the recording of the Australian e-series webinar on the topic: here is a link to this recording. Just follow the prompts to download the Blackboard Collaborate software and it will open in a separate window from your browser. Although I attended as a participant, the first seven minutes is taken up by a 'web tour' by yours truly whilst the group waited for Trent, the presenter, to arrive. Funnily, he left his presentation at work and had to return for it (not sure why he didn't put it in his Dropbox, then he needn't have had to go back to pick it up!) Never mind, he's way more competent at Evernote than me. Do you use Evernote? Feel free to reply here to share your experiences. Here is the link to the recording of the webinar on Evernote held in our ACFE Blackboard Collaborate Room on 8th May.